OAKLAND — A judge Wednesday postponed the sentencing of two men convicted of murdering journalist Chauncey Bailey, saying he wanted to hear from a lawyer for the prosecution’s star witness who said in a newspaper interview last month that his client may have fabricated bits of his story. Alameda County Superior Court Judge Thomas Reardon ordered attorney LeRue Grim to appear Aug. 12 to explain what he meant when he told Bay Area News Group investigative reporter Thomas Peele that the witness, Devaughndre Broussard, may have “committed a little bit of fabrication” in his story. Grim did not offer Peele any specifics, and it remained unclear Wednesday when or if any fabrication occurred. Reardon also ordered Peele and Bay Area News Group colleague Josh Richman to appear on the same date. Peele, Richman and reporter Matt Krupnick shared a byline on the story that was published June 11. Bey IV and Mackey were convicted last month of murdering Bailey and Michael Wills. Bey IV was also convicted of ordering the murder of Odell Roberson. The jury could not decide if Mackey killed Roberson. Nevertheless, both men face life in prison without the possibility of parole. Defense attorneys representing the pair asked for an investigation into Grim’s comments because Broussard supplied vital testimony in the murder trial. Broussard admitted that he killed Bailey with the help of Mackey and killed Roberson but said he did so on Bey’s orders. He also testified that Mackey and Bey bragged about killing Wills. Defense attorneys argued throughout the trial that Broussard was not trustworthy because, in part, he initially told police that Bey was not involved in Bailey’s killing. 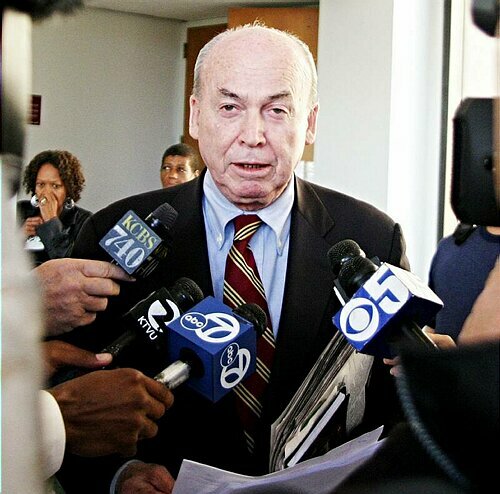 Alameda County deputy district attorney Melissa Krum said she welcomed the investigation to ensure any future appeals of the case would not hinge on a “chitchat” Grim had with a reporter. “I have no reason to believe Broussard committed perjury when he testified,” she said.